SKUAST Recruitment 2018. In latest employment news applications are invited for Professor, Chief Scientist, Sr Scientist & Jr Scientist & Other jobs. 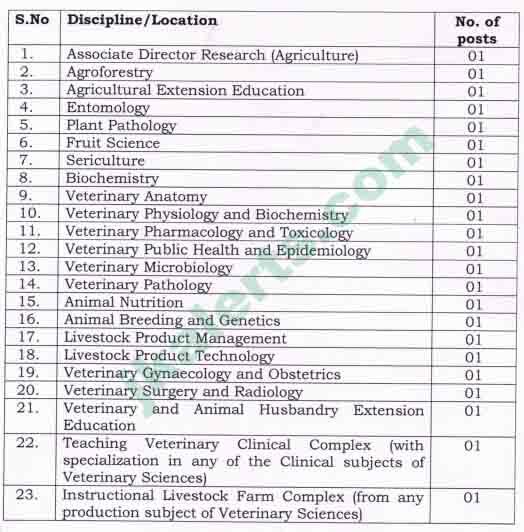 Doctorate degree in the subject concerned (in case of Associate Director or Chief Scientist, Doctorate Degree in any branch of Agriculture/Veterinary and Allied Sciences or in specified disciplines as the case may be). 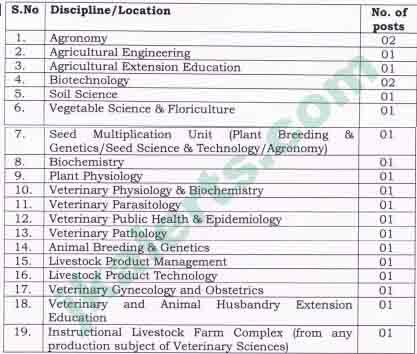 Ten (10) year’s experience in the relevant subject out of which at least eight years should be as Scientist/Teacher or equivalent position in the pay band-III of Rs 15600 39100 + GP of 5400/6000/7000/8000 (pre-revised) and two years as Associate Professor/Sr. 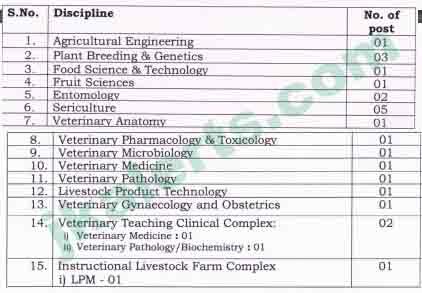 Scientist or equivalent in the pay band-IV of Rs 37400- 67000 with grade pay of Rs 8700/9000. Good research experience as evidenced by publications. Ability to provide leadership in the subject/discipline. Doctorate degree in the subject concerned. Eight (8) years’ experience in the relevant subject as Scientist/Teacher or equivalent position in the pay band-III of Rs 15600-39100 + GP of Rs5400 /6000 /7000/8000. Research Experience as evidenced by publications. Allowances and provident fund: As per SKUAST Statutes and rules of J&K CSR. Age: Not less than 20 years and more than 55 years as on 01-01-2018. The upper age is relaxable for employees of SKUAST-J. Nature of appointment: Temporary with two years’ probation. In-service candidates: The in-service eligible candidates should forward their Application Forms through their employer. The application form which is not routed through proper channel shall be summarily rejected and no correspondence and/or enquiry thereon shall be entertained. In case of selection of in-service candidates, their services shall be regulated in accordance with the statutory provisions as are in vogue or may come into force from time to time. OBTAINING: Application Form along with API Score Card Format can be downloaded from SKUAST-J website skuast.org. SUBMISSION: Application forms complete in all respects duly supported by attested copies of all certificates and testimonials obtained by the candidate before last date of receipt, should reach the office of the Registrar, Sher-e-Kashmir, University of Agricultural Sciences & Technology of Jammu, Chatha-180009, Jammu, J&K along with a non-refundable Application Fee of Rs 2000/- (Rupees Two thousand only) in the shape of Demand Draft drawn in favour of Comptroller, SKUAST-J payable at Jammu.